Release of new update of the Word to HTML component for .NET. The improved rendering of bullet list, content formatting and extended set of RTF tags. Renewed HTML parser. Word to Html conversion with improved quality. Word pictures. New samles VB.NET and C#. RTF to HTML convertion enhancements. Reworked HTML algorithm. RTF dicuments. 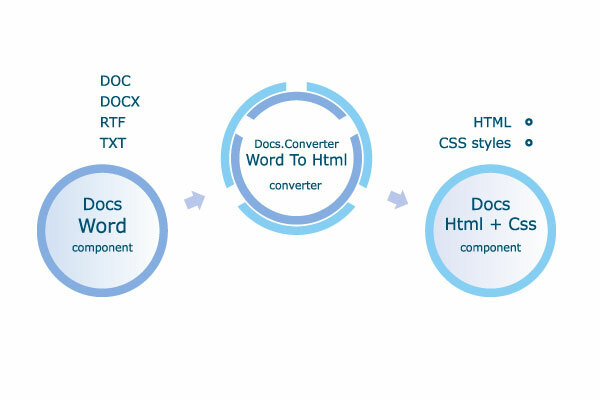 Word To Html .NET converter offers an easy-in-use and fast method of converting MS Word DOC, DOCX or RTF documents to Html format.The converter includes a powerful Word and HTML engines. It supports the following Word documents: DOC, DOCX and RTF. The component can be used as a method to show the Word documents in the internet browser. The Word To HTML .NET converter can be used on the local computer or on the server. It is absolutely independent and does not require to install addition software or modules. Supported Word document formats DOC, DOCX, RTF. Supported Image formats: jpg, png, gif, bmp, emf. Section settings (Page size, Page orientation etc.). Requires only .NET framework 2.0 or higher. Works on servers with medium-trust level. Works well with web and desktop applications. The lite version converts RTF to HTML only. It includes all features of the conversion Word To Html except the converting from DOC and DOCX word documents.